I was debating with myself about whether to write this post in English or Portuguese, but I’ll just stick with the blog’s official language. The translated title of this book is The History of the Siege of Lisbon. 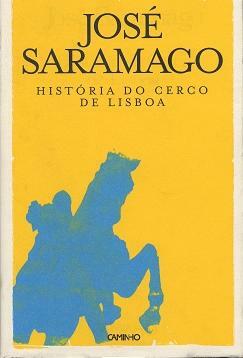 It’s my fourth Saramago and as always his premise just tickled my curiosity: Raimundo, a lonely proof-reader, is working on a non-fiction book called The History of the Siege of Lisbon. For a reason not even he understands, he decides to change a single word is a crucial sentence. In Raimundo’s modified version, the Crusaders who were on their way to the Holy Land do NOT help the Portuguese conquer Lisbon from the Moors in 1147. Unlike what I was expecting considering Saramago’s usual magic realism, after that NOT is inserted, History doesn’t change and the proof-reader doesn’t find himself all of a sudden living in a Moorish Lisbon. What does change is Raimundo’s own story. Beyond that point, the book is divided into two: on one hand Raimundo starts living and loving (there’s a great part about the difference between looking, seeing and noticing) and on the other hand we follow an alternative Siege after the Crusaders’ refusal which the proof-reader himself decides to write. Saramago was fascinated with the role of the “insignificant” individual in major events and the concept of fiction vs. History. If you think about it, there are History books that read like (and make assumption jumps as if they were) novels and there are novels that read like History books transforming the general notion of What Really Happened (Da Vinci Code?). Especially when dealing with times so far gone, each tinny less-than-factual conjuncture can change History as we know it. It was Raimundo’s job to find these lapses and correct them, but instead he changed the Past with one single stroke. Everything that was not life, is literature, History also, History above all, And paintings, and music, Music is resisting since its inception, it comes, and goes, wants to get rid of the word, I suppose because its jealous, but it returns to obedience, And paintings, Well, paintings are no more than literature made with paintbrushes. You see how right he is? You might have realized this a long time ago, but it hit me like a ton of bricks: everything that is beyond the moment it was lived enters the world of storytelling. “History above all.” Such a simple idea, such a subtle novel, so much to think about and wonder. It’s a beautiful book, but Saramago makes the reader work for his reward. If you ever read any of his books, you know how his approach to language and punctuation is… unique. He writes as he thinks (or talks), so once you let go of those pesky grammatical conventions everything becomes much more enjoyable. Saramago is so famous for his political ideas and attacks on religion that it’s easy to overlook his gift for writing love stories. Baltasar and Blimunda (from the book “Baltasar and Blimunda”, my favourite by him) are still one of my favorite couples in literature and the two love stories in The History of the Siege of Lisbon are so well crafted, so realistic, they made me realize that only a man who loved Pilar del Rio as much as Saramago did, could have written them. There’s even a documentary about their relationship (sorry, trailer in Portuguese). Finally, I also saw this book as an ode to Lisbon. It made me ache for being there, especially now that Spring is in the air. Raimundo’s walks and the descriptions of everyday life so faithful (drinking an espresso at the neighbourhood café, the light reflecting in the river) that I became sure there’s no place like home. Sometimes, you just need to be away to figure it out. 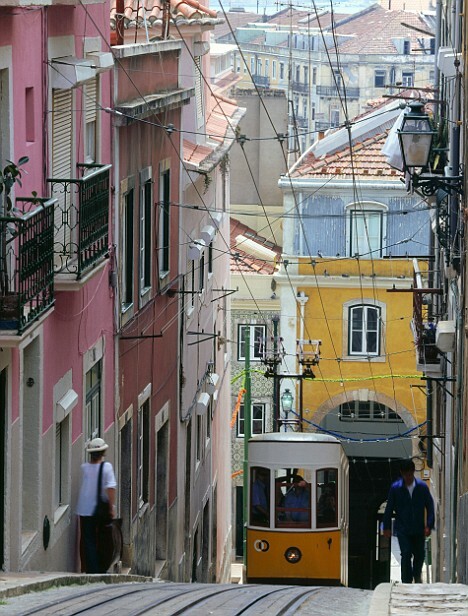 I would love to visit Lisbon one day! I completely understand what you mean about sometimes needing distance from a place before it really begins to feel like home. I never felt fiercely Canadian until I moved to the U.S. and then I started to miss Canada desperately and realize how much a part of me it is. I love Saramago’s writing, but haven’t read this one yet. I’m so pleased to see that it is another of his thought provoking ones as I thought it was a straight history and so wasn’t that excited about reading it. You’ve changed all that. I’ll have to push it further towards the top of the pile. I’m glad you didn’t write it in Portuguese as I wouldn’t then have found out about this book which is now going onto the TBR list!